The Locarno Pact was a series of agreements involving Germany, Belgium, France, Britain, and Italy, the seven treaties were initialized on October 16, 1925, and signed in London, on December 1. The Pact was meant for the parties to mutually guarantee peace in western Europe, such as stating that the Franco-German and German-Belgian borders set up by the Treaty of Versailles were inviolable. Germany essentially was not allowed to use force to change its western borders, however its eastern borders could be changed by arbitration. The major concepts invovled are regional security, appeasement, national security, and cooperation. The Pact of Locarno was mainly designed to affirm the treaty of Versailles with regards to western Europe, while Germany was admitted into the League of Nations. 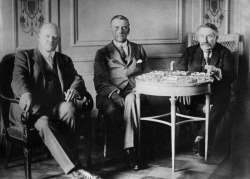 The treaty attempted to promote cooperation and improved relations between western European powers, by guaranteeing that France, Belgium, and Germany were not to attack each other. However, the treaties could be seen to have created an excuse for conflict in eastern Europe, as those borders were subject to change. Germany signed arbitration treaties with Poland and Czechoslovakia, and France signed treaties to guarantee assistance to Poland and Czechoslovakia in the event of a conflict to Germany. Due to appeasement, the treaties would fail to promote peace between Germany and its neighbours. France and Britain did not act to prevent the reoccupation of the Rhineland, and France would make no effort to back up its alliances with Poland and Czechoslovakia.